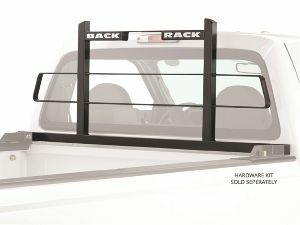 Showing 1 - 9 of 9 Products for Truck Cab Protector / Headache Rack. If you are looking for a headache rack that combines function and style, this BackRack(TM) mesh insert headache rack is a perfect choice. It comes with two mesh inserts that offer clear visibility through the back window. They are powder coated for superior corrosion resistance and easily bolt into the frame using stainless steel cap screws. 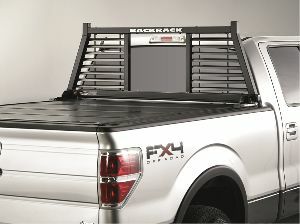 Half Louvered Headache Rack by BackRack(TM). Don't be like everyone else on the road. Get this headache rack and create the look that reflects your style. This cab guard comes with two louvered inserts that provide shade for your cabin. They are powder coated for superior corrosion resistance and easily bolt into the frame using stainless steel cap screws. 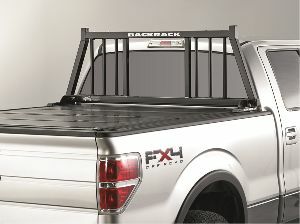 Back Rack Cab Guard by BackRack(TM). BackRack's cab guard protectors mount to existing stake pockets at the front of your bed to protect your cab from damage caused by large, heavy cargo that may shift forward. For cargo such as small pipework, the "Safety Rack" comes with a welded criss-cross center grid to give you the most complete protection. Reinforced steel construction ensures high strength and rigidity, and a protective layer of black powder coat resists scratches, chips, and corrosion. Has welded wire mesh to provide full window protection. Has wider carrying capacity above cab. Each intersection of wire is welded to avoid rattling and provide strength. Less flexibility to mount accessory light brackets than the BACKRACK(TM). Is more expensive than the BACKRACK(TM). Sits higher above the cab than the BACKRACK(TM). 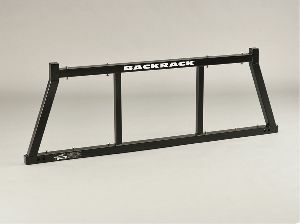 Round Verticals Headache Rack by BackRack(TM). Are you tired of your pickup truck looking like any other truck on the street? 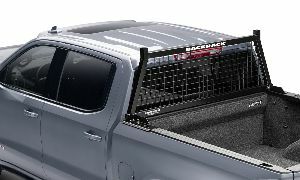 Choose this cab guard from BackRack(TM) and give your vehicle a one-of-a-kind look. The rack comes with Three Round style inserts that are powder coated for superior corrosion resistance and easily bolt into the frame using stainless steel cap screws. BACKRACK(TM) has doubled the corrosion resistance on the Louvered Rack by E-Coating the Frame before Powder Coating. Being unsatisfied with the Powder coverage in tight areas of the Louver assembly, BACKRACK(TM) does it right by immersing the entire Frame into a multi stage dip process to cover every hidden surface. 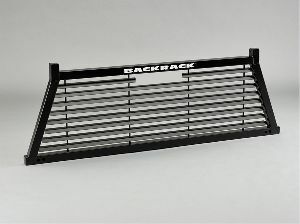 Headache Rack by BackRack(TM). BackRack's cab guard protectors mount to existing stake pockets at the front of your bed to protect your cab from damage caused by large, heavy cargo that may shift forward. For cargo such as small pipework, the "Safety Rack" comes with a welded criss-cross center grid to give you the most complete protection. Reinforced steel construction ensures high strength and rigidity, and a protective layer of black powder coat resists scratches, chips, and corrosion. Multiple light mounting brackets are available but sold separately. Lights Headache Rack by BackRack(TM). With this headache rack from BackRack(TM), you will make your truck stand out from the crowd and get added visibility and protection when braking thanks to the lights. The rack comes with two inserts that are powder coated for superior corrosion resistance and easily bolt into the frame using stainless steel cap screws.